It was a beutiful spring day in Mchenry Illinois. After doing my chores on my farm, I sat in the shade and was admiring the clouds in the sky. I was wearing polarized sunglasses if that made any difference, I don’t know for sure. After about a half an hour I saw a small flash of light next to one of the clouds. I focused my eyes on that spot. At first I thought they were giant birds diving in and out of it but later I realized this did not make sense because that is not common practice for any bird I know of that does this sort of thing. I observed the objects for about 30 to 45 seconds before running for my camera. They were gone when I got back. What I saw were round (percieved from a distance) objects diving in and out of a cloud in a slight arc fashion. One at a time they would do this. They would climb back up in a stairstepping motion. What was interesting they reacted to the sun once a reflection was made they would Dive “reflection” then climb, dive “reflection” then climb, dive “reflection” then climb. They formed a conterclockwise eccentric circle. There are many reports from the 1940’s till current that were and are identical to mine. What I find very intersting about my sighting was that I observed their behavior. A reaction to the sun tells me these were not mechanical craft but living creatures that we publically are not informed of. The author of the book Unconventional flying objects by Paul R. Hill, I believe a scientist for N.A.S.A. claims he saw objects forming the same eccentric type circle that I saw and also states that another object flew in from another direction shortly after the circling display. This is another reason why I believe that some are more a living thing than nuts and bolts craft because of the reaction to the circle signaling manuever. NOTE: The above image is a rendering. 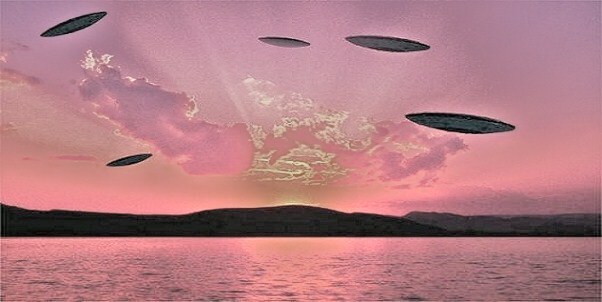 KEN PFEIFER WORLD UFO PHOTOS ……… Special thanks to my facebook friend Ben Garfield for his incredible encounter.